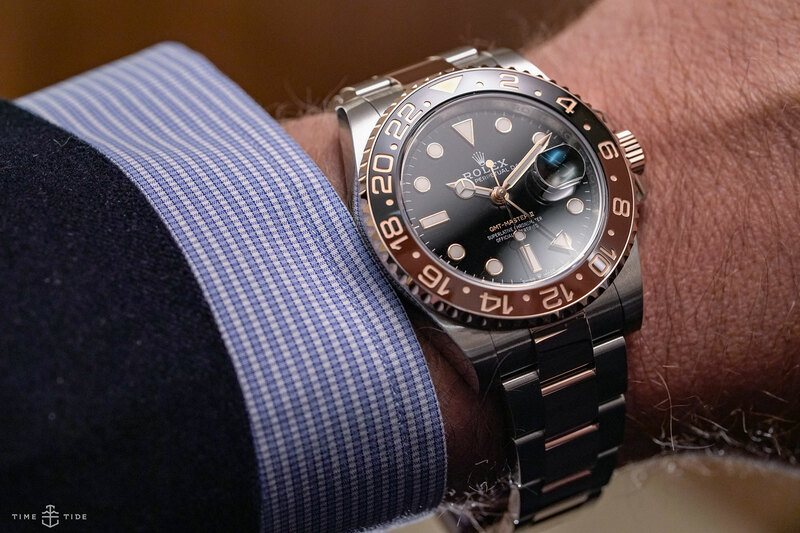 Cola was the hot topic leading up to Baselworld 2018 when it came to speculation about new Rolex releases. Would the Big Crown twist the lid off a new ‘Coke’, a two-colour red and black Cerachrom bezel GMT-Master II model, or rather open a cold can of Pepsi, referring to the two-colour red and blue Cerachrom bezel GMT-Master II? The fact that it was the latter was not a surprise as much as the fact that it was in stainless steel, or ‘Oystersteel’, as 904L steel is to be known henceforth. The new generation Jubilee bracelet choice, as well as a new movement — the 3285, extending the power reserve from 48 to 70 hours — made this a very meaningful evolution of the wildly popular collection. Rolex’s dextrous little parry landed a hit squarely on journalists, fans and the industry, but no sooner was that noted by the scorers then the other releases also started to emerge. In addition to the expanded GMT-Master II range, which also includes the first ever Everose GMT-Master II, we have a proportionally improved Deep-Sea Sea-Dweller and a gem-set Daytona that is hot, hot, HOTline bling.